Galco's KingTuk® Inside-the-Waistband (IWB) Holster is a highly versatile design intended for comfortable, covert wear. Its removable metal belt clips can be attached to different holes along the backing plate, allowing for a custom setting of both the height and the angle for a smoother, faster draw. The backing is made from lined saddle leather with a Napa leather front, making it highly durable and allowing it to mold to the body over time for an extremely comfortable fit. The holster pocket is crafted from rigid Kydex®, which protects the firearm while holstered and maintains its shape when empty for easy reholstering. The belt clips fit a belt up to 1.75-inches wide. The versatile holster can also be outfitted with optional C-Hooks for greater concealment. Large frame autos maybe not so much but still its feels good I'm only a 34 waist and i think if you are heavier it will fit better...sets high and i like that 1.75 more stable width on belt. Really comfortable for an IWB holster. Total disclosure: I'm not a big fan of IWB generally and Kydex holsters specifically. I don't find IWB to be a very comfortable mode of carry but sometimes they are the best concealment option, particularly for large frame autos & revolvers. That being said, the King Tuk is the best IWB design as I've tried to date. It took a substantial amount of wear before it broke in, but eventually became acceptably comfortable. It is stable on the belt due to the distance between the belt clips, but this means it also takes up a good bit of room on the belt as well. I use mine to carry a 3" Kimber 1911 with ambi-safety cocked & locked. The weapon seats snugly in the Kydex holster with an audible click and so far I have not had the safety brushed off, something I have had happen often with other IWB designs and one of my major gripes about them. the weapon is held securely yet is still very accessible. Worn behind the hip the weapon is well concealed, even under just a loose t-shirt. I've yet to try tucking in a shirt over it, just seems like too much effort. I give the King Tuk a 4 rather than a 5 because of the Kydex holster, I understand why it is used in this design, I just don't like it. Again, well worth the price. Good comfortable holster EXCEPT, the smooth leather on the inside turns this holster into a shoehorn for sliding your pants off. I fixed that with some 40g sandpaper. Good, solid, secure comfortable holster. Couldn't be happier. Exceeds all my expectations. 5 stars! Awesome holster, in my opinion it's better than my Crossbreed. Excellent product. Best I've found. Very fast shipping. Easy to use website. I couldn't be happier with this holster, especially since I carry a full size glock. 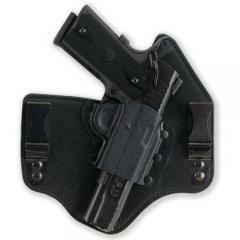 The holster is made very well and rides comfortably. Just after receiving it I had to qualify at the range, so I put it to use immediately. I was impressed with the way it worked and how natural it felt. I would recommend this holster to anyone needing a concealable holster that can be worn all day.